When I was growing up, I truly loved my grandmothers’ big Southern, country breakfasts. They would put out salty country ham, sausage gravy, bacon, eggs, biscuits, fried apples, sliced tomatoes, homemade apple butter, and just about anything else you could think of to put on a biscuit. 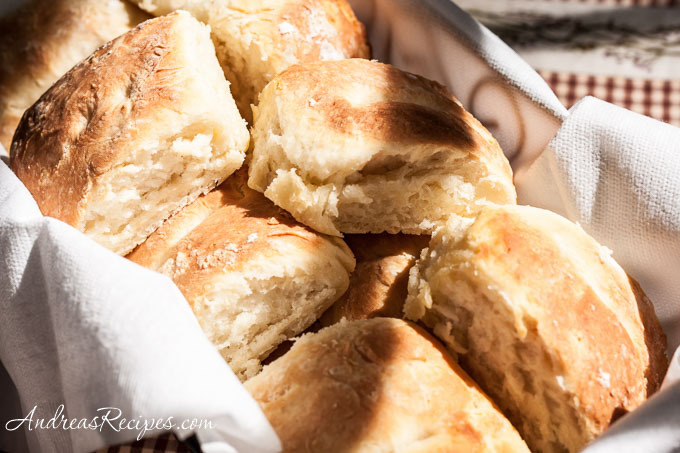 My maternal grandmother made these pinch biscuits, which she learned from her mother, and my paternal grandmother made rolled biscuits. These next three posts will honor my favorite foods from both grandmothers’ big country breakfasts. I was always mystified by how my grandmother made these biscuits. She never seemed to measure any ingredients, and she mixed them in a metal bowl using only her hands. She pinched off pieces of dough and shaped them in her hands, never using a cutter. I tried to emulate her technique many times and could never quite get it down. My mother makes wonderful pinch biscuits, and I was able to capture her at work for Easter morning breakfast. My mother doesn’t measure ingredients, either, so we’ve estimated as closely as possible. Mom says that she doesn’t know why you are supposed to press knuckles into the biscuits, that’s just how all the women in her family have done it for generations. My great-grandmother raised 12 kids on a tobacco farm during the Depression. With so many mouths to feed you have to be thrifty, so she would sift any lumps out of the remaining flour and save it for the next time she made biscuits. Adapted from my mother Germaine McClure, passed down from my grandmother and great-grandmother. Add flour to mixing bowl and make a well in the middle. Add the buttermilk and shortening. Work the shortening with your fingers, breaking it up into very small pieces. Start working the flour into the liquid, pulling it in a little at a time. Work in just enough flour to make a soft dough, neither sticky or dry. There should still be some flour around the edges of the bowl. You should NOT use all the flour. Dust some flour on your hands. Pinch off pieces of dough about the size of a small orange or tangerine, about 1/3 cup. Work the dough in one hand, using your fingers to move it in a circular motion. Don't press hard, you just want to shape them. 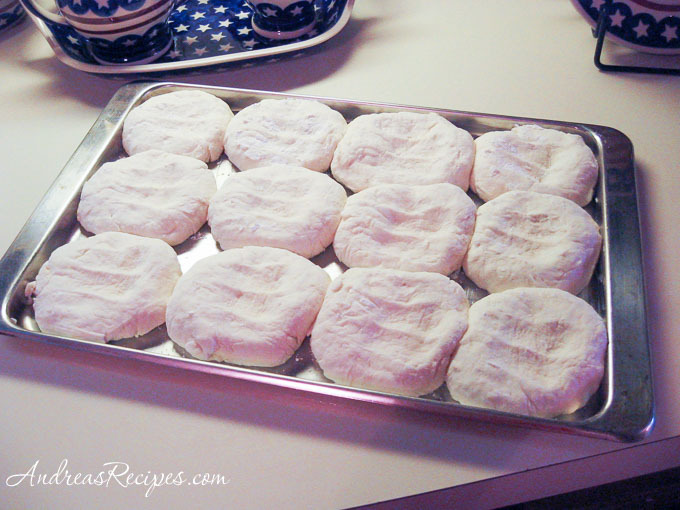 Lay each biscuit on the greased baking sheet right next to each other, with no space in between. Once you have all the biscuits on the sheet, press three knuckles lightly in the top of each. Bake for about 20 minutes, or until golden brown on top. Remove from pan immediately, place in a basket, and cover with a tea towel. My mom made her biscuits the exact same way…and the knuckle prints in the picture made me cry. She did the same thing with something she called T-cakes which were dryer and had nutmeg in them but unlike the biscuits her prints stayed on the T-cakes after they were baked. I would give a million dollars to have one today with my mothers knuckle prints. I understand how you feel. I wish that I had spent more time in the kitchen with my maternal grandmother really learning how she did things, like her fabulous coconut cake. It would have been fun to try and make one with her! I’m am currently on the hunt for her apple butter recipe. One of my uncles makes it in the fall, so I’m pestering him to share the secret! This is a lovely old recipe for biscuits. I’m American and want to introduce my Welsh husband to our foods, as my Mom introduce him to Cuban cuisine, that he and all his family love here in UK. I’m making the bicuits instead of Yorkshire pudding, and so far it has being a big bang. Next I’ll make them with cheese for breakfast instead of fried bread! But it gets better, I’m converting every one to BICUITS. Thanks so much for this sight. 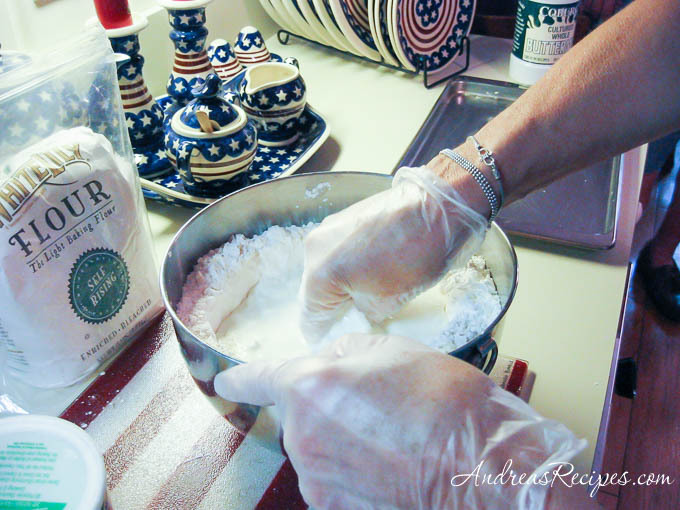 I have been trying and trying and trying to make the perfect southern buttermilk biscuit. Living in the North now I can’t get the Lily White so I order it online but try as I may I can’t get my grandmothers light fluffy results. I’m a little ashamed as no self respecting southern woman should make such horrible bisuits as I do. Wanted to know if you can help me. I follow the recipe and technique to a T but still get flat and crumbly texture. Any advice? Shawn: I don’t know how you much you work the dough, but my first suggestion is to only work the dough enough to bring it together, and handle each biscuit as little as possible. Overworking the dough will make biscuits flat. Also, make sure your flour is fresh because the leavening agents tend to lose strength over time. Storing flour in the freezer is a good way to preserve it’s freshness, especially if you only use it occasionally. Just keep it in a strong freezer bag. Regarding the knuckle-prints, I saw an episode of Alton Brown (Food Network TV) and he indicated that you flatten the biscuits with your knuckles so they will rise evenly. He said if you didn’t then you end up with ‘dome’ shaped biscuits — something about them heating from the sides first then the middle. It’s funny to hear people talk about making things a certain way and when challenged, will say, “…well that’s the way grandmother made them!”. You also do this to hamburger patties, leaving a dimple in the middle so they will be flat when done. The less you handle the meat the better. Thank you so very much for this recipe, when i was growing up my grandmother would make 4 pans every sunday for the entire family. Growing up i watch in amazement each and every time she made them. She had a huge bowl she kept her flour in and mixed everything in that bowl and somehow managed to keep all the flour dry except what she used. She passed two years ago and i have tried and tried to get it right and never have until now. Now my family can enjoy chocolate and biscuits on sundays just as i did as a child. Once again thank you for helping keep a family tradition alive. A very interesting biscuit. I can’t get buttermilk here, so I guess I’ll replace it with yogurt. I’ll try to make this to eat with curry. I’ve tried this with minor adaptations and I loved it. Perfect recipe. Just as my grandmother and mother made them knuckle prints and all. Thanks.